Features: Jet black hair and eyes. Scar on his chin. Taps his fingers. 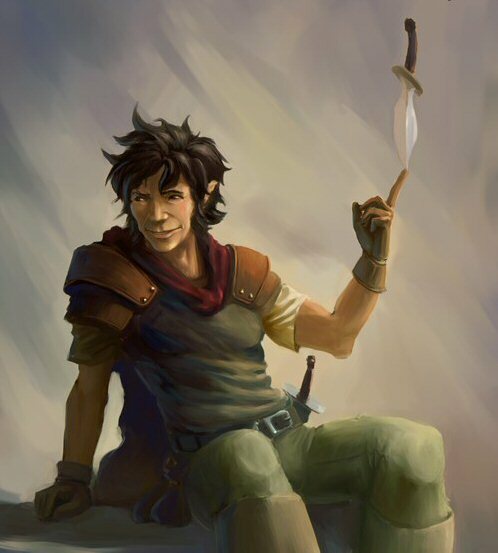 Background: Pangold is a native of the Elsir Vale (Dennovar) and his Shentulka heritage is plain to see due to his coppery coloured skin and jet black hair and eyes. His mother however is of Nerathi descent and this is how he was raised, even though his father also taught him about his Shentulka ancestory. Personality: Pangold is an altruist at heart. Seeking to help those in need. He has little respect for those in authority unless they use their power to aid others. Though he carries a weapon he dislikes using it and will do so only as a last resort. He is a naturally gifted priest of Pelor and sometimes this leads to him straying from the sometimes strict doctrines of the church hierarchy as he thinks he knows better. Gaming Goals: Seeks to aid his friends & others in need. Care to the wounded and sick. Spread the word of Pelor. Convert others to Pelor. 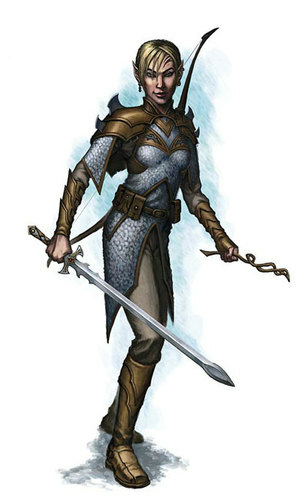 Features: Serin is a rather nondescript halfling. He has wavy black hair, and a dark tan, from spending much of his life on the boats and barges that ply the riverlands of Elsir vale and beyond. Background: Serin has never known a home beyond the back streets of one town or another, or climbing the ropes of various boats. While work as a deckhand was enough to get by, it never really provided the excitement that Serin needed, and he found himself engaging in more and more illicit activities on the side. He has finally decided that it's time to seek his fame and fortune, in addition to having a bit more fun along the way. Personality: Serin is adventurous and risk-taking. He has seen it enough times over the years, that those who take the biggest risks tend to wind up with the biggest rewards. He is often described as 'happy-go-lucky', in that when he doesn't tend to get the rewards, he immediately puts it behind him and moves onto the next adventure. Serin is genuinely friendly, and able to get along with almost anyone from any background. He makes friends easily, and is happy to go out of his way to help those who have helped him. Gaming Goals: Serin claims to want to make enough money to settle down and lead a life of comfort, but he doesn't seem to really try to save any of his money. It seems that the most important things to him are pleasure and making a name for himself as a talented adventurer. Important Items: Serin doesn't really go in for sentiment, or at least hasn't found anything anything worth considering irreplaceable. Wish List: Something that allows him to fly. Some sort of magical defense so he doesn't have to continue wearing uncomfortable armor. Background: Marus grew up in a wealthy Nerathi family in Brandol so he was rather sheltered from the problems of those lesser stature. 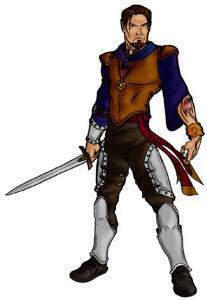 At a young age he became a squire for Sir Kyan Hirgrim and learnt the Knights code as a Lion of Brindol. 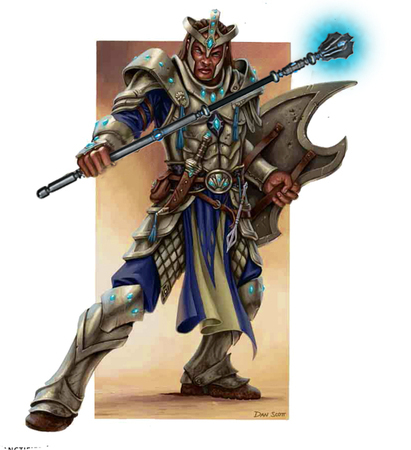 He spent the next 5 years under the teachings of Sir Kyan until his demise after a fatal tournament accident. Marus having lost his mentor returned home to be greeted by his cousins at the family manor, Marus hated his cousins and wondered why they were there, and they were all to eager to educate him on the matter that his parents were deceased. They went further, as if they relished the fact, that they were held up by bandits on the road and were killed for their coin. Marus's world crumbled before him, and all this in a matter of a week. Marus's inherited the family manor but refuses to even enter the manor grounds, he spent the next few weeks drowning his sorrows in mead and ale. He decided he needed to leave as he couldn't take being in Brandol any more, Marus travelled the country side until he came to Drellins Ferry. He continued his downward spiral of self destruction until one day while in the local tavern a man rekindled the flame of hope for him after a deep and meaningful discussion with Pangold Tigersoul. Marus still does not know why Pangold helped him, but since then he found a new purpose. Personality:He is very quick to try and prove himself to others, which is often his downfall as he rushes into things. He tends to be very naive about lower classes of society and there lives. Important Items: The sword that was given to him by his former teacher. Background:Vanna grew up under the teachings of her mother and father, her mother taught her magic and her father passed on his skills with the sword. She had an older brother who was also accustomed using a sword and that of the wild. Recently Vanna's father was murdered by a mage which was after a family heirloom. Vanna and her brother tracked the mage several hundred miles, across the Golden Plains and then across the Elsir Val. After encountering a group of bandits on the road her brother was struck down and perished, not having any tracking skills the trail went cold. She travelled to the nearest town, Drellins Ferry, where she spent the next few days planning her next course of action. In her time here she came to know a halfing named Serin Talberon, he proved useful in finding her information. Personality: Likes to plan out her actions. She sees the world in black and white, if you break the law no matter the circumstances then you should pay.